Only five months into his career as CEO of Intel, Brian Krzanich is pushing the chipmaker in a new direction and he laid out Intel’s plans for 2014 during a CES keynote. Over the coming months, Krzanich says that Intel will be trying to move into the wearable tech market and although it already has some strategic partnerships in the industry, it will need to evangelize the market to attract other companies. 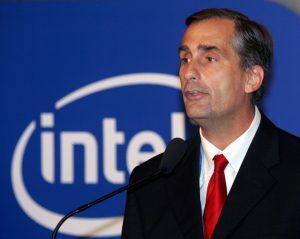 Alongside the push into the emerging wearable tech market, Krzanich has confirmed that Intel will be continuing to move in the direction of expanding its environmental and ethical consciousness. To do this, it will no longer be using “conflict materials” in any of its chips. These materials usually come from poor and dangerous regions in Africa, where local workers are used to attain precious metals and other items for the tech industry. Even though much of Intel’s Day 0 Keynote was dedicated to putting the company behind the wearable tech market and promoting its potential, Krzanich admitted that so far, most smartwatches have not solved any real problems. In the beginning of Intel’s opening keynote, it showed off a new personal assistant called Jarvis (like the assistant from Iron Man.) It may not be as advanced as Iron Man’s assistant, but it is Intel’s answer to Siri and Google Now, as a way for people to maximize their device’s potential. All of the wearable tech that will be based around Intel products will be coming out starting this year and the devices will utilize the new Edison chip. Intel’s Edison allows for a processor the size of a memory card to have as much power as a regular PC. This is in stark contrast to current smartwatches and wearable tech, which can do very little when compared to traditional electronics, but Intel may be able to change that. Summary: Intel CEO Brian Krzanich is leading Intel in a new direction and much of its plans for the coming year were shared during the company’s opening CES keynote. A new chip, Edison, will expand Intel’s potential in the wearable market, and its new personal assistant, Jarvis, will compete with Siri and Google Now.